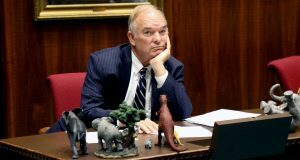 The Arizona Senate is rejecting a series of ethics measures proposed in the wake of the 2011 Fiesta Bowl scandal. One of the proposals voted down Thursday would have banned lobbyists from giving free meals to legislators. Others would have prohibited campaign contributions by lobbyists to legislators or candidates for the Legislature and barred legislators from accepting free trips or tickets to sports or entertainment events. The ethics-related proposals were offered by Sen. Steve Gallardo as amendments to an elections bill. Separate bills on some of those proposals were bottled up at the Republican-led Legislature.